I believe 2018 will be the year inflation arrives. The reason, as I’ve noted throughout mid-2017, is that multiple Central Banks, particularly the European Central Bank (ECB), Bank of Japan (BoJ) and Swiss National Bank (SNB) have maintained emergency levels of QE and money printing, despite the fact that globally the economy is performing relatively well. All told, in 2017 alone, these Central Banks will printed over a $1.5 trillion in new money and funneled it into the financial system. This is an all-time record, representing even more money printing than what took place in 2008 when the whole world was in the grips of the worst crisis in 80 years! And it has finally unleashed the much sought after inflation. Around the world, inflationary data are breaking out to the upside. 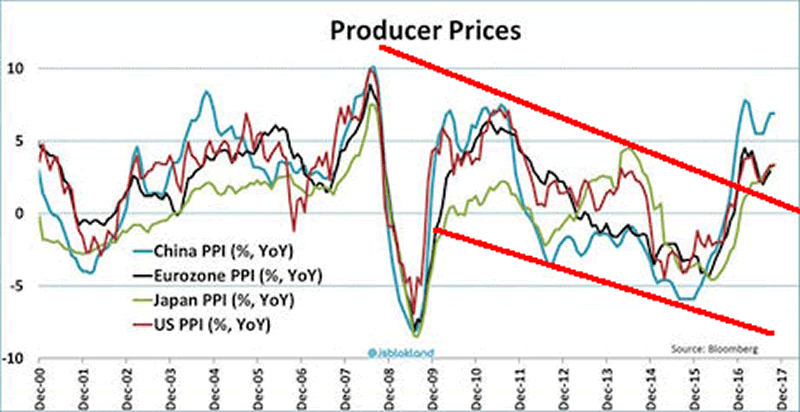 Producer prices are soaring in the EU, Japan, China and the US. Because the $199 TRILLION Bond Bubble trades based on inflation. When inflation rises, so do bond yields to compensate. When bond yields rise, bond prices FALL..
And when bond prices fall, this massive bubble, which I call The Everything Bubble bursts. This process has already begun. Around the world, bond yields are spiking to the upside as the bond market adjusts to the threat of future inflation. Graham also writes Private Wealth Advisory, a monthly investment advisory focusing on the most lucrative investment opportunities the financial markets have to offer. Graham understands the big picture from both a macro-economic and capital in/outflow perspective. He translates his understanding into finding trends and unde74rvalued investment opportunities months before the markets catch on: the Private Wealth Advisory portfolio has outperformed the S&P 500 three of the last five years, including a 7% return in 2008 vs. a 37% loss for the S&P 500. © 2017 Copyright Graham Summers - All Rights Reserved Disclaimer: The above is a matter of opinion provided for general information purposes only and is not intended as investment advice. Information and analysis above are derived from sources and utilising methods believed to be reliable, but we cannot accept responsibility for any losses you may incur as a result of this analysis. Individuals should consult with their personal financial advisors.